A Large Hotel Chain Looking For Experienced Food And Beverage Supervisor to join their food and beverage team, based in Abu Dhabi. This is a job through a job consultancy. * Reporting into the Operations Manager, the catering Supervisor will be responsible for all aspects of food and beverage service and coordination of meeting rooms/conference rooms. * You will provide a high quality food and beverage service, consulting on event management requests, knowledge of meeting room technology and relationship management with hospitality contractors to meet the dynamic needs of the organisation. * You will provide premium levels of customer service, build strong rapport with internal clients and external customers and demonstrate excellent communication skills. * You will oversee stock inventory levels, maintain the cleanliness and hygiene of the kitchen areas, and ensure all food safety policies are being adhered to. * With this role you be needed to cover the reception duties as relief cover. 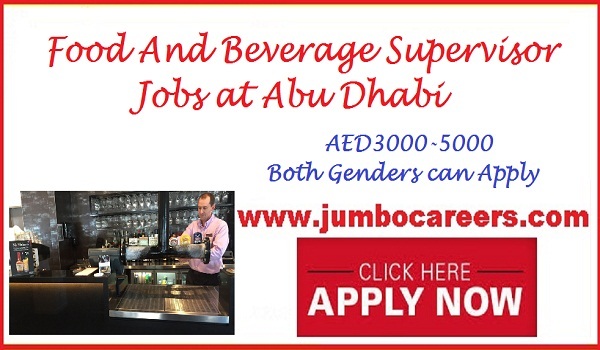 How to Apply for F&B jobs in Abu Dhabi?